The Big Trouble in Little China game was first announced last year. Now we have a first look at the game, and it looks stellar. The board game is in the final stages of development, with pre-orders available now for the deluxe version and a regular retail version. 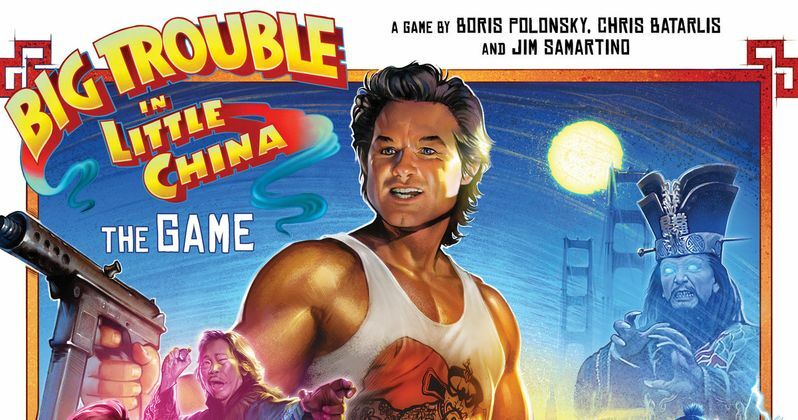 The game is obviously based on John Carpenter's movie, Big Trouble in Little China, and was designed by Chris Batarlis and Boris Polonsky. The trailer shows off the game in great detail and it really looks just as weird as the movie, which is totally a good thing. Polonsky and Batarlis detail the game through their trailer video on Vimeo page and it looks even cooler than the still pictures. "In Big Trouble in Little China the Game you'll embark on a wild adventure to experience the exotic and mystical underworld of Chinatown. You and up to 3 other players (1-6 in Deluxe) take on the roles of their favorite iconic heroes from the film like Jack, Gracie, Egg, and the rest of the gang." The deluxe version of the game really seems like the way to go and for $99 it's a steal when taking into consideration the amount of detail that went into this independent game. The trailer for the video is narrated by a decent Kurt Russell impression that lays out the game even further. The game gets even closer to the feeling of the movie by giving each character unique abilities. Each character uses their unique talents and abilities to take on various missions throughout Little China. Players work together gaining chi and audacity to level up in preparation for the Final Showdown to take down Lo Pan, the Three Storms, and a bunch of other enemies. Palonsky and Batarlis look really intent on giving a true "cinematic experience," which was a rare occurrence for board games and video games back in the 80s when the movie came out. Related: Did the Big Trouble in Little China Remake Forget About John Carpenter? Independent board and card games are in the middle of a renaissance at the moment. The indie games are gaining popularity as of late as a new way for friends and acquaintances to socialize with each other without using a computer or electronic device. Players must sit in the same room to play and in the case of Big Trouble in Little China; players must work together to strategize. Games such as Tiny Epic Kingdoms, Zombicide, and the upcoming Starcade are really pushing the boundaries of creativity for indie games while providing a unique social experience that's way cooler than Monopoly will ever be. It is not clear at this time when the finished product will ship, but it appears to be just about finished and as previously stated, you can preorder a deluxe version and the regular retail version. The core version of the game contains the double-sided game board, a quest book to narrate the story quests, 40 crazy detailed miniatures (that are worth having alone), 38 molded dice, 6 hero cards, 5 boss cards, 168 cards, fate track, as well as dozens of tokens and pegs. While the deluxe version throws in a limited metallic gold box, 7 more quests, 38 additional cards, custom dice, the addition of a sixth player and an alternate Lo Pan boss board. Check out the trailer for the Big Trouble in Little Chine: The Game below.